BRIGHT HOPE BAPTIST Pastor Kevin Johnson on Sunday related to his congregation the story of Caleb, who urged Moses to lead the Israelites into Canaan - a land of powerful enemies that few believed could be conquered. Perhaps it is with this story in mind that Johnson, 39, is exploring the possibility of running for mayor in 2015. Like Canaan, Philadelphia's political arena is filled with mighty tribes and entrenched power - a land, you could say, that "devours those living in it." And like the Israelites, Johnson is essentially an outsider. He has never run for elected office, and he moved to Philadelphia to join Bright Hope in 2006. "The city needs leadership and when I look at the results that we have been getting from the traditional persons who have run, I think that it's now time for us to think outside the box," said Johnson, who told the Daily News he is forming an exploratory committee. It's too soon to tell whether Johnson could successfully cast himself as a political outsider, but there's little doubt that the void for such a candidate exists. Many are complaining that the expected field of mayoral contenders - a state senator, the city controller, several Council members and others - is too heavy on traditional or party "machine" candidates. A Johnson candidacy would undoubtedly shake things up. "Right now, the mayor's race is wide open," political consultant Larry Ceisler said. "He comes from a very prestigious church that has launched many political careers. Why not, really?" Although Johnson, who lives in Overbrook Farms, may be relatively new to Philly politics, Bright Hope is not. Former U.S. Rep. Bill Gray III and his father were pastors at the church, at Cecil B. Moore Avenue and 12th Street. Gray, who became the highest-ranking black congressman ever and helped launch the careers of countless Philadelphia politicians, died last year, and Johnson gave his eulogy. "He was a great man and achieved a lot for the city," Johnson said. "His spirit is on me, and I know that and I'm really just trying to stay in that Bright Hope tradition . . . of community activism but also economic development." 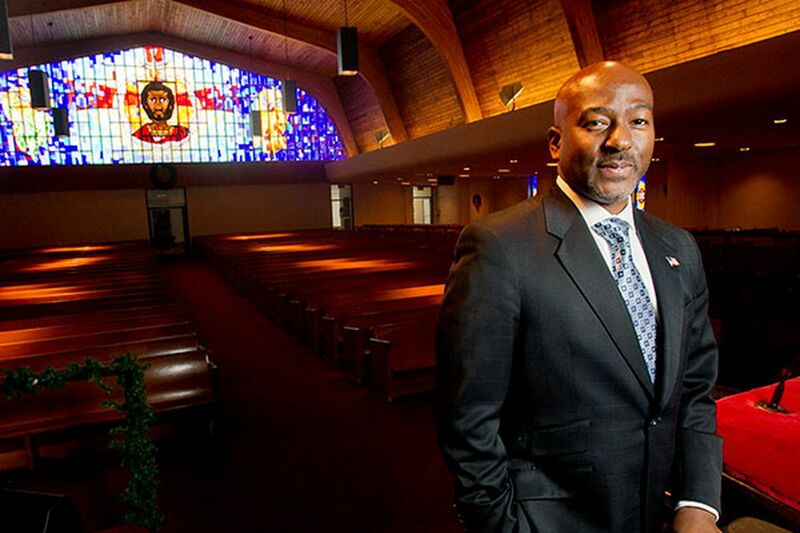 Last week, Johnson asked the church's board of trustees for their support if he runs. "I wanted them to be informed first what's on my heart, what I feel I'm being called to do," he said. "Also I realize that whenever this decision is made, that I need Bright Hope. Bright Hope was there for Rev. Gray, and if we move in this direction, I pray that Bright Hope will be there for me." Garnering significant political support from the congregation is not a sure thing. Last month, the Daily News reported that some members were unhappy with changes in the plan for developing the old John Wanamaker Middle School site, which is across the street from the church. The Goldenberg Group, of Blue Bell, partnered with the church's community-development corporation, Bridge of Hope, to purchase the land from the School District of Philadelphia in 2007. Goldenberg is putting up a $100 million, 14-story building to house up to 800 Temple University students. They had originally planned to help Bridge of Hope build a charter school on the site as well, but now the school is to be built elsewhere, at a site to be determined. Some Bright Hope congregants told the Daily News they felt duped. Johnson yesterday described the change as a deal that "started out as a real-estate relationship and now has shifted to being an economic relationship." The project seems to be central to a job-creator narrative Johnson may push as a candidate. Walking over to the site during an interview yesterday, he emphasized that Leaks Construction, an African-American-owned company, received an $8 million contract with the builders and that many minority workers are being trained on the project. City Councilwoman Marian Tasco, a Bright Hope member and disciple of Gray's political organization, declined to comment for this story. Along with economic development, Johnson's other top campaign issue would be education, he said. He stressed that he has three children in public schools and called on the state to revamp its funding formula to aid distressed school systems. Former Mayor W. Wilson Goode Sr., now a minister at the First Baptist Church of Paschall, in Southwest Philly, said that being a member of the clergy requires you to have a certain voice: "One of passion, one of a moral compass, one of a conviction - all those things are important to have if you're going to run for office." "Anyone who decides to run with his kind of background, with money and with the right kind of support can potentially win," Goode said. On Sunday, Johnson used the story of Caleb to describe how civil-rights leaders like the Rev. Dr. Martin Luther King Jr. overcame seemingly insurmountable barriers by believing that God was behind them even when the odds were against them. Johnson said that he, too, has decided to take on uphill battles, like applying for a job when others have longer resumes. "I have sized up myself in comparison to them, and I say, 'God I cannot do it,' " he said. "But that's when God begins to speak with me and to you. . . . I don't need a resume." Johnson roared, "God says, 'WE CAN DO IT!' "
- Staff writer Chris Brennan contributed to this report.